Comments Off on Hey, Canadians – wanna go to the loonie store? The loonie store is a wondrous place. I found these salad containers there – they have a compartment in the lid where you put your dressing so when you’re ready to eat, you just push this button on top, and pop! the dressing goes into the container below (hopefully you put some salad in there first). Give it a shake and your salad is ready to eat (so long as you have a fork. I suppose you could use your hands, but that would get messy). My point is, you never know what you’re going to find at the loonie store. And wouldn’t you be interested in finding out what other people’s loonie stores carry? OMG. Loonie store nirvana. If you do and you want to participate in an exchange, pop on over to Just One Miss’ Dollar Store Challenge (yes, it originates in the US so it’s a “dollar store” not a “loonie store” – although I find our name much more entertaining). The way it works: you leave a comment, and you’ll be contacted via email for your mailing address and then you’ll be paired up with someone. Take $20 and go to the loonie store and buy some stuff. Put it in a box and mail it to the person you were matched up with. You’ll receive a box too. Then you can blog about it. Or whatever. But Miss wants more Canadians! So go. Comment. And sign up by March 10 (that’s Wednesday, people). Left Coast Mama: Oh that’s okay. They don’t monitor the meters at 6:15pm on a Sunday. (Click to embiggen if you like). Edited to add: in no way am I blaming Left Coast Mama, who arranged for a group of us to go to High Tea at the Secret Garden, and whose husband, the ever-gentlemanly @AnthonyFloyd, took care of the Poptart for a couple of hours. I just happen to have the worst parking luck ever. I almost always luck out and find a spot, but am prone to getting parking tickets. Like the time I parked (illegally) to dash into a bakery for 5 minutes, came back out and found a By-law officer writing me a ticket. I hopped in the car and drove off before they could say anything though. 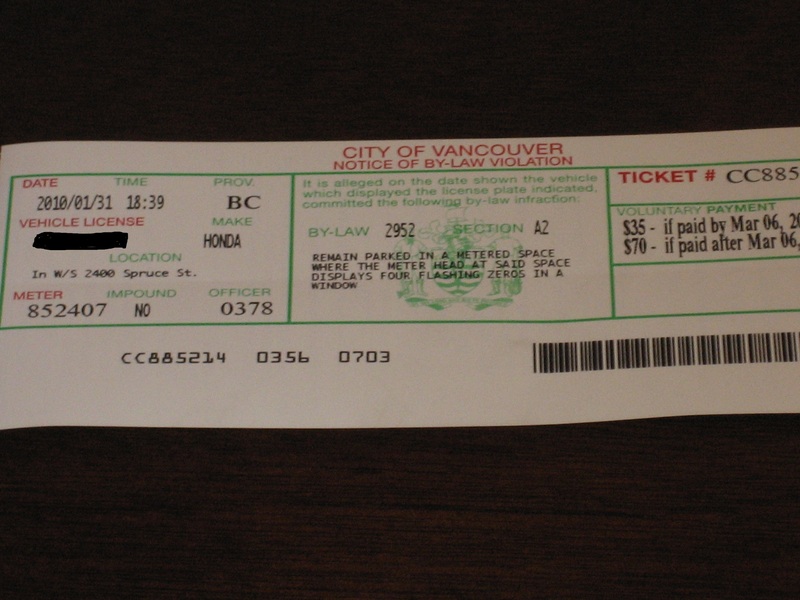 And then there was the time on Commercial Drive when the meter expired 10 minutes before I got there and I had a ticket. On a Sunday. At 5pm.